The Foreign Office is over-staffed, inefficient and resistant to change, according to a report ordered by the department itself. 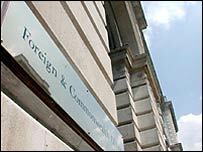 The damning consultants' report says one in 13 staff at the Foreign Office could be axed. It says: "The entire organisation needs to be challenged and reformed but the leadership lacks the skills needed and the will to upset the status quo." The Foreign Office says it has already acted on the report's recommendations. The report was brought into public view by Labour MP Andrew Mackinlay, who had it placed in the House of Commons library. "It is a devastating report, showing systematic poor management, lack of accountability and bureaucracy by the Sir Humphreys and Terry Thomas-type characters who still occupy the top echelons of the Foreign Office," said the MP. Consultants Collinson Grant finished their report at the beginning of the year. The Foreign Office is "slow to act"
Middle managers feel obliged to "monitor, review and repeat work in order to 'justify their existence'"
The Foreign Office is already pledged to save £87m over three years and the report was designed to help achieve the savings. The consultants identified £66.1m of potential annual savings but to be realistic, they recommend a target of saving £48m a year. More than 1,200 jobs could be axed from the Foreign Office, which has a staff of about 16,000 based in the UK and overseas, they say. The report warns current efficiency plans were slipping. And it says: "There is no incentive for reducing costs - more a culture of maintaining and gradually increasing expenditure, building on precedent." It goes on: "Employees are seen as generalists so that a lack of professional competence or experience in (say) finance or human resources (or even in specific political or diplomatic skills) is accepted even where it acts as a significant drag on the effectiveness of a department." It argues that a culture based on achieving consensus inhibits change. And few diplomats want to become managers, producing a culture where risks are avoided. The consultants say: "Those assigned controlling functions quickly seek jobs back in the political stream. They therefore avoid controversy and conflict to ensure they can 'rejoin the club'." The Foreign Office's leadership focused primarily on diplomatic and political duties and rarely on efficient management, says the report. "Senior grades by intervening in too much trivia end up overloading themselves and working excess hours unnecessarily," it argues. The consultants interviewed hundreds of staff and say people are frustrated by the "weakness of the organisation, yet unwilling to tackle the root causes that are entrenched in, and reinforced by the established culture". They complain of poor accountability with an appraisal system which rarely sees staff given low grades which would be expected even in the best organisations. "There is no real 'carrot or stick'," says the report. "Careers are rarely affected by failure to manage functions, costs or people effectively." A Foreign Office spokesman said: "The report did what we wanted - to look at our working practices and see where we can make efficiency savings." Changes had already been introduced since the report was introduced, he said, including cutting administration, reallocation of staff and replacing UK-based officials with local employees at overseas posts. A modernisation programme was also under way to make the Foreign Office more open and diverse, he said. The spokesman stressed the report had only looked at efficiency rather than look at service delivery.